See it for yourself. Cycling holidays in Drenthe. If you're a regular reader of this blog you'll know that we upped sticks and moved here from the UK because it is the best place in the world to cycle. There is no-where else with the number of cyclists that this part of the Netherlands has, and no-where else with such wonderful facilities for cycling. Assen, where we now live, is the capital of the "cycling province" of the Netherlands, Drenthe. Groningen, a few km North, is the city with the highest cycling rate in the world. The weather in May is generally marvellous for cycling, and it carries on right through the summer. Last Sunday was an absolutely beautiful day. Our children rode with their friends to the beach, while Judy and I went out to plan a new route for our cycling holiday customers. We took a few photos and a bit of video while we were doing it. As ever, we barely saw any cars, and also as ever, there were thousands of other people cycling ! If you want to see it for yourself, come on one of our cycling holidays. We passed many cafes, pancake restaurants, and also you often find people selling things informally outside their homes. In this case, an old bakfiets was parked next to a small country road, loaded with countryside produce. A country estate on the route. This is the location of one of several museums on this route, and this location also has a petting zoo and a cafe. You can also see it in the video. We've several other blog posts showing cycling holiday routes and destinations, and a few more which you might like under touring and recreation routes. A recent report from the Fietsberaad shows that merely having lower speed limits is not enough to achieve adequate safety for cyclists or other road users. The Netherlands now has over 40000 km (25000 miles) of roads with a 30 km/h (18 mph) speed limit (out of a total of 120000 km of road). These roads are safer than 50 km/h ( 30 mph ) roads, but not as safe as they used to be. The number of cyclists and pedestrians injured and killed on 30 km/h roads is rising as the lower limits have been applied more widely. Drivers have also become more familiar with the lower speed limits and break them more often. In the last ten years, as the proportion of roads with the lower speed limit has grown, the injury figures have more than quadrupled on 30 km/h roads. These have gone from from 2.4 to 11.7 serious woundings per 1000 km of 30 km/h road. Two thirds of accidents involving children 11 and under occur as they cross roads. Also of note: A large number of the injuries occurring on 30 km/h roads take place at uncontrolled junctions. In Dutch cities where other potentially more dangerous designs of junction have already been addressed, it is uncontrolled junctions which are left as amongst the most dangerous. Note also that if cyclists are to be given priority at road junctions then designs need to be very careful to avoid a heightened rate of injury as that has all too often been the result of giving priority to cyclists. I should explain that I think lower speed limits, especially on residential roads, are a fine idea. They make the environment more pleasant, including more pleasant for cycling and they do play a part in improving safety. However, the benefit of changing speed limits alone only goes so far. This is being given far too much emphasis in countries which are trying to get something for nothing in terms of growing the cycling rate. If you want more cyclists, you need to address such things as subjective safety and directness of cycle routes. You need not just the benefit of lower speed limits, but the much greater benefits which comes from the whole package of sustainable safety measures. Merely putting up a different speed limit sign on a busy street doesn't achieve much in the way of safety for cyclists if their routes remain shared with drivers. Motor vehicles need to be excluded from roads used mainly by cyclists. The Netherlands still has the safest cyclists in the world, and despite the large number of vulnerable road users, Dutch roads vie to be the safest roads overall in the world. Do Dutch drivers stick to limits ? The simple answer is 'no'. Just as everywhere in the world, drivers in the Netherlands break laws that they think they'll get away with breaking. The photo shows a road on my commute which has a 30 km/h speed limit. I always ride my bike along this section above the speed limit, but even if I'm riding at 35 km/h or more, almost every car still passes me. Dutch drivers are very much like those elsewhere. Speeding in this location lead to the only incident of anything approaching road rage which I experienced in five years of living in the Netherlands. Also read about how speed limits are being reduced in rural areas. If not just lower speed limits, what else is important ? Campaigns based only on speed limit reduction can never achieve the scale of change required to make the streets and roads of a country safe for everyone to use. Lower speed limits are just one tool out of a number which are required to create the needed change. Amongst the other things which the Dutch do to increase the safety and convenience of cycling are unravelling motor-routes from cycle-routes, building very high quality cycle-paths, allowing cyclists to avoid traffic light junctions, and making it easy to cross the road. All these things come under the umbrella of "sustainable safety" and they particularly benefit the next generation. Note that pedestrians also benefit from sensible policies, not just "cyclists". After criticism, Cambridge police retracted their statement that they would not enforce the law, but a few years later the Association of Chief Police Officers in the UK again said that they would not enforce lower speed limits. I took this photo on Saturday morning. These three bike baskets are amongst those I worked on last week. I sent the rectangular one with a lid along with a front rack to a customer in the USA, while the D shaped basket with the green willow stripe has gone to Scotland. The larger basket in the rear is being made to fit a Radical Design Cyclone bicycle trailer, and will be finished off this week. It's got both red and black willow in it to produce the pattern. As well as the standard bike baskets, I make custom bike baskets, for any type of bike and they've been sent to all corners of the world. You can see some examples on my website. I also work at the ligfietsgarage in Groningen for two days a week, and last week I helped produce these Mango velomobiles, four of which have already been taken to Germany. I made some of the wheels, put together the electrical systems, and made a few other sub-assemblies which ended up in these bikes. It's really very satisfying to be able to do this varied work, and to see the results going away to be used. I was delighted to hear on the TV a few weeks ago that Essex in the UK has realised the folly of trying to reduce the usage of cars simply by reducing the availability of spaces to park them in new residential areas. It has been policy in the UK for many years now to provide inadequate space for cars to be parked with the idea that this will somehow result in fewer people owning and using cars. Cars cars cars, in the way because people have not been provided with enough space to park. The result has been a mess in new developments, such as that shown here: "The Quills" in Histon, near Cambridge where we used to live. This seemed also to be pretty much the pattern for other new developments in the area. I took these three photos a couple of years ago when we lived in Cambridge. This housing development was not yet finished, and not all houses were occupied, yet the pavements (sidewalks) were already covered in cars. The route out of this estate by bicycle is the same as the car route, and rather drag-strip like. I was astonished then that people would buy a house in such an area and I'm still astonished. These places are made ugly by the presence of cars and everyone who lives here and owns a car has stress added to their lives because of the difficulty of parking the car. 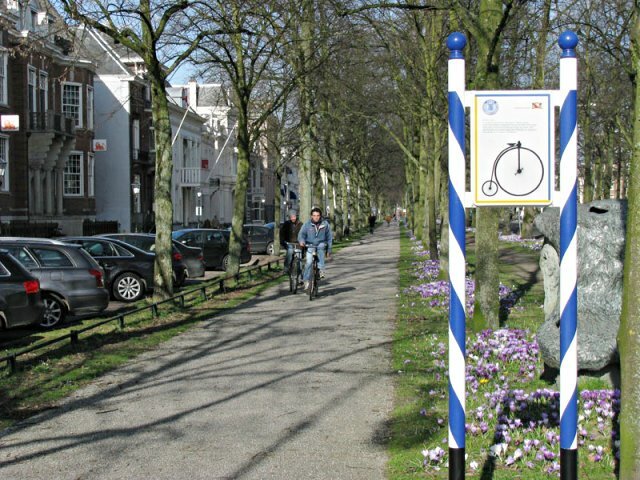 Dutch street scene: Design to encourage cycling. Car parking is given separate space. In addition to these spaces, these homes also have garages and extra parking at the rear. By way of contrast, here are three photos of how new Dutch housing areas look, taking as an example the nearest new housing estate to our home in Assen. This isn't an exceptionally cycle friendly design, but rather what is now quite standard in the Netherlands. It's not a new thing, but more or less what has been normal for over twenty years. By bike you have more routes and more direct routes than by car with routes for cars and for bikes unravelled from one another. As a result of this and the presence of many cycle-paths, cycling is an attractive alternative to driving. Note the wide cycle paths. Also that there is adequate car parking for the cars owned by the population. Drivers are not left "fighting" over an inadequate number of car spaces. No-one parks their car on the pavement or on the cycle path. There's no need to do so. As a result, neighbourhood conflict due to parking is very uncommon and of course cycling or walking through this area is easy. It's pleasant to cycle through residential areas in the Netherlands because they are not dominated by cars. The design encourages cycling by positive steps, not by trying to make owning a car unpleasant. Focus on making cycling pleasant, safe and direct as has been done in the Netherlands and it has a chance of becoming popular. Focus instead on making conditions bad for driving and you'll simply end up with grumpy drivers. Car ownership in the UK used to be lower than that of the Netherlands. Now it's the other way around. Read more posts about this new Dutch suburb. Not only does it cater for peoples' private cars, but it is also a place where 2/3rds of primary school children cycle to school as well as virtually all older children. The shopping centre prioritizes cyclists and pedestrians and there is excellent access by public transport. A few days back I had reason to visit the dentist. My dentist is very pleasant, but I can't say that visiting her is my favourite activity. I'm sure you have no desire to read about my teeth, but I thought the journey there and back might be of interest. Most of it is on cycle paths like that shown in the first photo. The road next to the cycle path in this case is not a through road, but provides access only to the few houses along this stretch. the road ends at the point of the hill in the photo, just a few hundred metres from where I took the photo, but the bike path carries on. The dental surgery is about 2.5 km by bike from my home. It would be slightly further by car, as I'd have to start off by heading in the wrong direction for a short distance. At this point the motorway junction is on the left, as is a major road. However, I ride on the access road here where there are no vehicles except those visiting businesses along here. This is the only set of traffic lights which I come across by cycling to the dentist. A specific cycle traffic light which stops all the traffic on this multi lane road so that I can cross safely and peacefully. On the other hand, If I had driven to the dentist I would have to pass through six major traffic light junctions like this one. This would make the journey take a lot longer than it does by cycling, and of course it would be somewhat less pleasant too. As you see, there is a cycle path here too, so it's possible to cycle this way. However, you then have to go through all the same sets of lights, so I would not normally go this way. So, back to the bike route. The last two photos were taken on the ride back home. It just so happened that I passed the head and deputy head teachers from the primary school that my youngest daughter attended last year. They're on their way home, riding together along the bike path by the canal. Quite a common site. It's not only children who cycle to school. Driving to work would be rather inconvenient for these teachers as there is no-where for them to park a car. And now we're very close to home, just the last little stretch along the canal and then I have two hundred metres of residential road to ride along. Happily, my dentist didn't hurt me at all, and given such a lovely route it was quite a pleasant outing overall. And why show this ? Well, it's just a typical journey. We didn't buy our home for its convenience for the dentist. Choosing a dentist came later. However, set off on any journey for any reason and it's probably going to be rather like this. This map shows the route by bike in red and by car in blue. Only the traffic light on the far left has any relevance when you cycle. That's the one shown in the photo above. The two others on the direct route back into the city centre before the major junction default to green for bikes. I also posted about a shopping expedition a few months back. Making mundane journeys like this attractive by bike goes a long way to attracting people to cycle for a large percentage of journeys. On the last weekend there were two events in Assen which required roads to be closed. There was a run in one part of the city, and a continuation of the series of "Dikkebandenraces" - "wide tyre races" (this refers not to mountain bikes but road racing on normal bikes for children to take part as an introduction to road racing). The latter is one of number of such races run one after another each year. Many competitors in the Tour de France started with the dikkebandenraces here in Assen. Anyway, that's just a normal weekend. Also in the year we have two triathlons (winter and summer), the jeugdtour (the largest youth cycle race in the world), the Vuelta a Espana (Spanish tour, starting this year in Assen), the Fietsvierdaagse (a four day non racing cycling event with 15000 participants - there are over 60 of these across the country during the summer), a walking vierdaagse event (there are probably more of these than of the cycling four day events), and many others. Also, just a few km down the road are the Ronde van Drenthe, the Erik Dekker Classic (famous local cycle racer's own event), and many more which I've forgotten to list all of which require roads to be closed. Across the country there are hundreds, if not thousands, of events each year which involve closing the roads. So why mention this ? I was reminded of its significance by reading about the Etape Caledonia held in a remote and relatively unpopulated part of Britain yesterday. It's the only mass participation cycle event in the UK for which roads are closed, and yesterday it was sabotaged by people putting tacks all over the road. A pressure group calling themselves "Anti Closed Road Event" claims to have nothing to do with this. What can I say about this stupidity ? Sometimes it's embarrassing to be British. I've known comments from other places about cycle paths not being maintained properly. That excuses are made that the paths are too narrow for vehicles which sweep up, clean them or to grit them. These two photos show two different types of cycle path. The first is a main cycle route for high speeds (I featured it previously, with video), while the second is a path past housing (motor vehicle access to these houses is at the rear). In the first case you'll see a council maintenance vehicle parked. Due to the cycle path being of the usual width for this part of the world it is much wider than the vehicle, so no problem with access. In the second photo you can see the characteristic lines in dust left by a road sweeping vehicle a few minutes previously. Both cycle paths are about four metres wide, and both have lighting at night. A well maintained path with lighting is what is needed for a good level of social safety. The How We Drive blog recently covered a British document about making Britain's roads the safest in the world. At present, as shown in the diagram, Great Britain (England, Scotland and Wales) has the second safest roads in the world, while the United Kingdom (also including Northern Ireland) has the fourth safest. The number one position is taken by the Netherlands. There is a very large difference between the Netherlands and the UK in the approach which has been taken to reduce casualties. Britain has achieved its safety in large part by removing the vulnerable and increasing the safety of crashing motorists. This has happened by several different means. Road designs are such that they discourage cycling, resulting in the UK having amongst the lowest cycling rate in the world. Children are increasingly transported by their parents cars and are comparatively rarely seen on the streets alone. Pedestrians are inconvenienced by waiting for light controlled crossings or take detours behind metal barriers. Many more roads in the UK have physical barriers alongside them to prevent cars from crashing into inanimate objects, and trees near roads are removed to make crashes safer. These things have improved overall safety, but at the expense of convenience and safety of pedestrians and cyclists. They have lead to more driving as a result, and an increasingly dangerous situation on Britain's roads for cyclists. The Dutch approach is very different. The Netherlands has the highest rate of cycling in the world. There are far more vulnerable road users and children in particular have a remarkable degree of freedom to roam. The convenience of cyclists in particular is paramount in design. These things individually could be seen to increase the level of danger to the vulnerable, but despite all of it the roads in the Netherlands are still safer than those in the UK, or indeed anywhere else in the world. There is a problem here for those who promote cycling in the UK. While Britain's overall safety record is comparable with that of the Netherlands, British cyclists experience about four times the level of danger (it's seventeen times as dangerous to be a cyclist in the US. Reference at the same link). Increasing their numbers will lead to the UK's overall casualty rate worsening. The only way to counter this is to do what the Dutch have done and make the vulnerable less vulnerable. 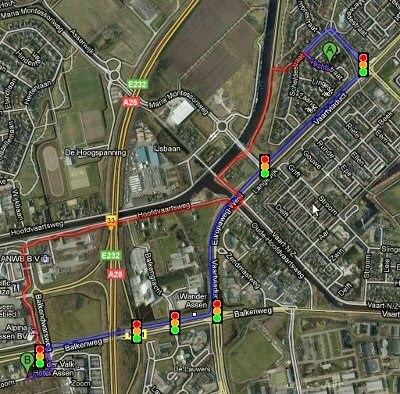 It is possible to do this at the same time as making cyclist's journeys more convenient. "Safety in numbers" is as much wishful thinking as anything else. Dutch cyclists are safe not merely because they are numerous, but because they have infrastructure which is sympathetic to cycling and makes cycling safe. The same number of cyclists plonked down in, say, London, would not fare so well. safety, not wishful thinking about safety in numbers. A look at other countries in the chart shows another possible future for Britain. Belgium, Italy, Austria, Denmark, Germany and Sweden all have higher cycling rates than the UK though lower than the Netherlands. They also all have worse overall road casualty figures. You can put this down to having infrastructure which is simply not quite so good as in the Netherlands. If Britain is to grow its rate of cycling and improve its safety then it needs a radical change to the way that planning is done. Cycling needs to be both attractive and genuinely safe. Reliance on the myth of "safety in numbers" will not make cyclists safe on unsafe roads. 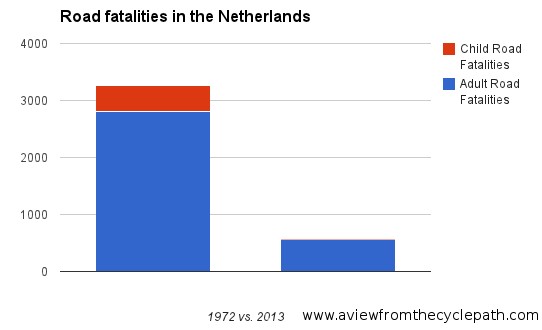 The Dutch give the credit for their extremely good result for road safety to the principles of Sustainable Safety. Other people have also written about suppression of activity by vulnerable road users. in cyclist injuries in the UK. 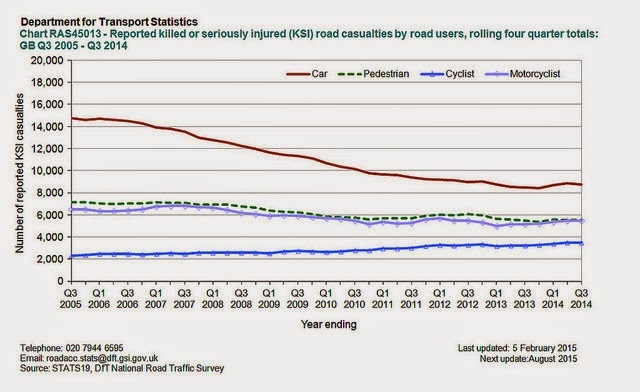 Sadly, my predication above that "Increasing their (cyclists) numbers will lead to the UK's overall casualty rate worsening" has proven to be true. The number of journeys made by bicycle in the UK has only risen a little, but cyclist injuries have risen along with that increase. 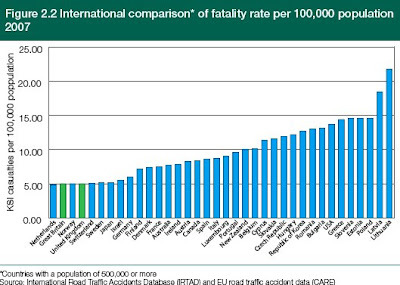 The UK and other nations with the same problem need to copy those things which truly work to make cycling safe and convenient. As for the other countries in the chart, some of you have a long way to go. American roads overall are nearly three times so dangerous as those in the Netherlands, but American cyclists experience 17x as much danger as their Dutch counterparts. Riding into the city on a Saturday is fun. The town is always full of bikes, and in the spring (i.e. now) and summer it can be quite hard to find somewhere to sit at the pavement cafes. We generally ride along the bicycle road shown in the video as it provides the most direct route from most places west, and it's very pleasant to ride along. There are generally no moving cars at all because it's not a through route for cars. While you only see a small part of the route in this video, the bicycle road extends most of the way out to the new development Kloosterveen which is 4 km to the west. There are other videos featuring parts of it here, here, here and here. This route was created over the winter of 2007/2008, including building the bridge part way along which carries the dual carriageway outer ring-road over the cycle path and other bridges which cross the canal. While the work was carried out, cycle routes were preserved by building temporary bridges. 41% of journeys in Assen are by bicycle. Just before making the video I'd stopped to take this photo of a Rabobank Cycling Team car, parked on the other side of the canal. It's one of several team cars often seen in the area, along with many professional racing cyclists of course. All too often people dwell on the utility cycling in the Netherlands, but it's only one of the many types of cycling which are popular. Kloosterveen is the location where I made a video showing Children Cycling to School which has been viewed nearly 20000 times. We have many more posts about Assen, and you can see photos of how the city used to look. Last Sunday, Arjen and I went to a cycle promotion event in Flevoland. It was at the FlevOnice facility, a unique in the world place with a 5 km long outdoor artificial ice-skating circuit. It's obviously not reasonable to keep this thing frozen during the warmer months, so it turns into a tarmac circuit for other purposes in the spring. We were at the first event for "Mei Maand Fiets Maand" ("May Month, Bike Month"), an annual bicycle promotion event. That there is a lot of cycling already in this country is, after all, no reason why more shouldn't be promoted. Flevoland itself is the world's largest artificial island. I find it fascinating. It's a vast area of land which used to be the sea bed. Draining it has resulted in hundreds of ship-wrecks now being on land, and it's protected by dykes built on an enormous scale (including this one which I cycled over last year). There are no buildings older than the 1960s on Flevoland, and three new cities: Lelystad, Dronten and Almere which were established in the 1960s and 1970s and consist only of modern architecture arranged on modern lines - with plenty of cycle paths of course. As we were there representing Sinner Ligfietsen, here is the company video presentation showing the bikes, including some glimpses of how they are built. Note that the examples pointed to are all real. This isn't just hot air, but policy which is already being implemented and which already has demonstrated success in this country. Of course, it's not just about CO2. There are various other benefits to society, such as lower cost of sickness, and not being so reliant on foreign oil. Meanwhile, back in the UK, driving is getting cheaper, encouraging higher car usage. My blog exists primarily in order to try to explain the differences between the way that things are done in this country vs. the way they are done in the UK and USA. Sometimes it can be difficult to get the message across as it is easy for people who haven't been here to imagine that everything is simply a little different. It just isn't like that. The little differences add up to more than the sum of their parts. The overall effect is fundamentally different. This video, made by mariojragucci2 re-captures my original thoughts on visiting the Netherlands. Truly a different way of living. Something that isn't easy even to imagine without being a part of it. While our initial shock was amazing enough, we kept on noticing more things, especially small things or societal differences for a long time afterwards. Having now lived in the country for a couple of years, many things now look ordinary to me, but it's great to have such a reminder as Mario's videos. The last minute and a half of the video are actually on streets with no restrictions on driving at all. However, you'll still see "no cars" (well, almost). On roads like this, still in the city, there are few places to usefully drive to and park along these roads, so rat-running through them doesn't tend to happen. Cycling is much more convenient. You can go anywhere by bike. I've several other posts about Groningen. Mario has several other videos on youtube. Please watch those too. The photo shows the first cycle path in the Netherlands, along the Maliebaan in Utrecht, the first home of the ANWB. This cycle path was created in September 1885 by the ANWB ( Algemene Nederlandse Wielrijders Bond ) - the organisation which still erects many directional signs for cyclists, even though it's a little more car oriented these days. The sign says that the development of the path came about "at the request of fourty four members of the ANWB, including one woman." 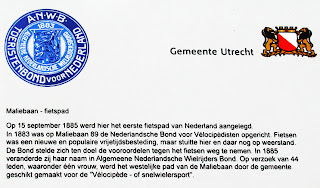 Also, it was intended from the beginning to be suitable for the sport of cycle racing, continuing a tradition of the Maliebaan which was created initially as a path for the sport of Malie and starting a new tradition of cycle paths in this country being suitable for use at speed. The ANWB itself was formed in 1883, changing its name to the ANWB a little later. Three of the leading lights in the early movement were Willem Einthoven, who later won a Nobel prize for medicine for inventing the electrocardiogram, a banker called Everard Kol and an Englishman, Charles Bingham, who had been involved with a local CTC group in the UK and found no equivalent when he moved to the Netherlands. If you are interested in more of the early history of cycling in the Netherlands, you may find this article in English to be of interest. It goes through the history of this early enthusiasm, the peak of enthusiasm in the 1920s and 1930s, and the sad decline in the motoring oriented 1950s and 1960s when cycle paths were removed in some Dutch cities to make more space for cars. Most of the current infrastructure dates from the 1970s and later. Again, I owe thanks to Mark Wagenbuur for the suggestion of this piece and use of his photos. He says "Isn't it curious that our Wielrijdersbond was created by Englishmen after an English example... And here you are over a century later thoroughly enjoying what since became our cycling culture." Indeed so ! Note: video includes captions which are only visible on a computer, not on a mobile phone.